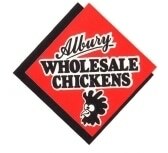 Albury Wholesale Chickens are wholesalers, distributors and suppliers of the fresh and high quality poultry products. We cater to a wide variety of clientele from schools and restaurants to caterers and pubs, clubs, butchers and supermarkets. At Albury Wholesale Chicken we specialise in the Wholesale and Distribution of Country NSW and Victoria’s freshest and Premium chicken. We offer all our clientele a delivery service which helps you take the stress out of running your business, speak to us to arrange a suitable time for your deliveries. All of our chicken is delivered in our very own licensed refrigerated vehicles. Our drivers start deliveries from 5.00 am to ensure prompt deliveries. Our delivery run includes Albury, Wodonga, Young, Griffith, Wagga Wagga, Wangaratta, Beechworth, Benalla, Bright and many other towns.